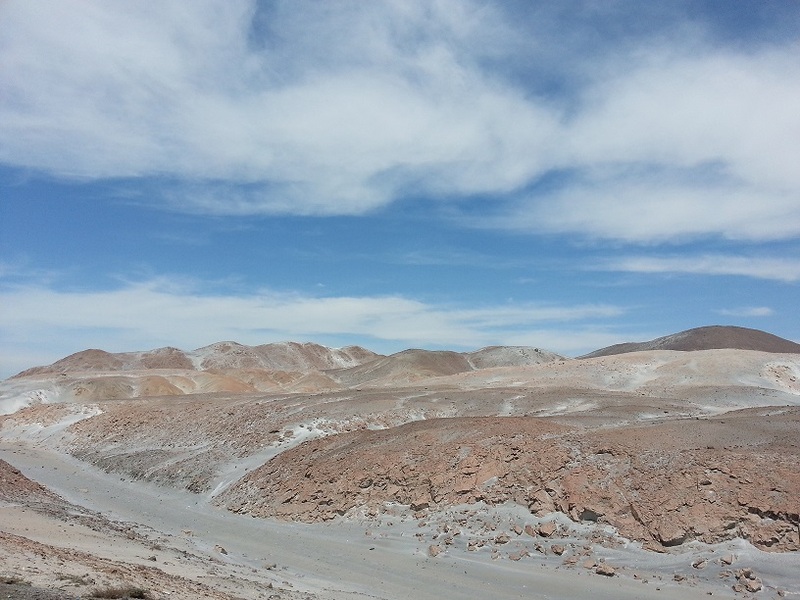 Leaving Arequipa and heading towards the border with Chile we were mesmerised at times by the stark beauty of the desert landscapes flowing past us and the myriad colours and shapes the mountains formed. The border crossing was one of the quickest so far, however still not very straight-forward, needing (amongst other things) to fill out a passenger list before exiting the country which it turns out is the means via which they ensure there are no stowaways by the other end of the crossing. Not sure how we’d get a stowaway on the bike? We were a little shocked that we weren’t surrounded by money changers sticking wads of cash in our face and offering exchange rates stacked in their favour. I missed the to and fro of negotiating the rate… and it also meant we were in a foreign country with no local money and in need of petrol! We ended up finding the bus terminal in the next town to convert our Sols to Pesos. Somewhat stupidly we thought we’d press on for the next town only to be held up by roadworks.. and the next town turning out to be no bigger than a fuel station and a restaurant. 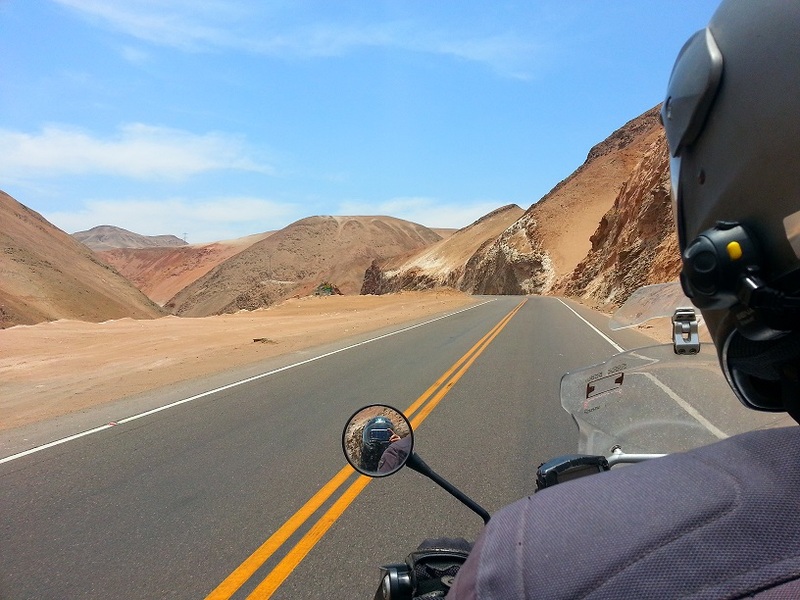 By the time we reached Iquique it was 9pm meaning a full 12 hour day on the bike AND we’d been riding at night, against the golden rule. We were both shattered and further shocked to find out we had lost two hours crossing the border with a time change and that it was actually 11pm. And… there was an issue with the bike just as we arrived into Iquique… a very loud bang followed by an extended whirring sound had me pulling over to the side as quickly as I could, convinced that – highly inconveniently – we’d just ‘achieved’ our first popped and now flat tyre… late at night, without accommodation, after a loonng day, in the middle of nowhere. However… lady luck was shining on us and instead of a flat tyre, it was actually ‘just’ that the mud flap on the back wheel had snapped off and was dragging against the tyre. Not so bad after all! Eventually we found some accommodation (at the third place we tried) and that was it for the night. On the positive side – we got to see (well, Lauren mainly – I was concentrating on the road) a spectacular desert sunset. The colours were amazing… and post sunset, when it was actually dark (and definitely past our ‘riding time’) we both saw a shooting star! Very nice. The amazing scenery between Peru and Chile.. wow! 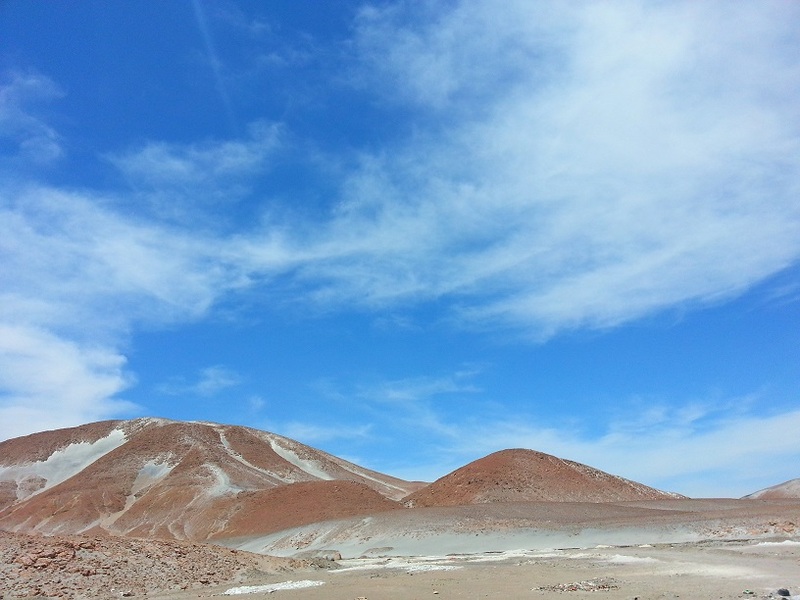 The colours kept changing from grey to red to orange to white to maroon and so on… it was just really spectacular. This entry was posted in Chile, Peru and tagged Gratitude, nature, wow. Bookmark the permalink.